But Huey wasn’t too fired up about the audition. "I went for the experience and didn’t expect much. I’m Asian. As I said to somebody as I was walking in, how likely is it that they’re going to cast an Asian girl as Ariel (the mermaid with white skin and red hair)? But then they said back to me, she’s a mermaid so her skin color can be anything," Huey recalled. "And I realized that I shouldn’t be setting myself up for failure." So she sang her heart out and the part was hers, as was the red wig. "It’s still Ariel with red hair, but it’s a beautiful wig that blends in some dark roots and that looks right on me,” Huey said. “And when I put on one of the dresses, which matches what Ariel wore in the castle scene, my inner six-year-old knew that I was wearing that princess dress!" The entire production is being built by the 5th Avenue Theatre, a Seattle company known for producing numerous Broadway-bound shows including the original Hairspray, Disney's Aladdin, Memphis, and others. 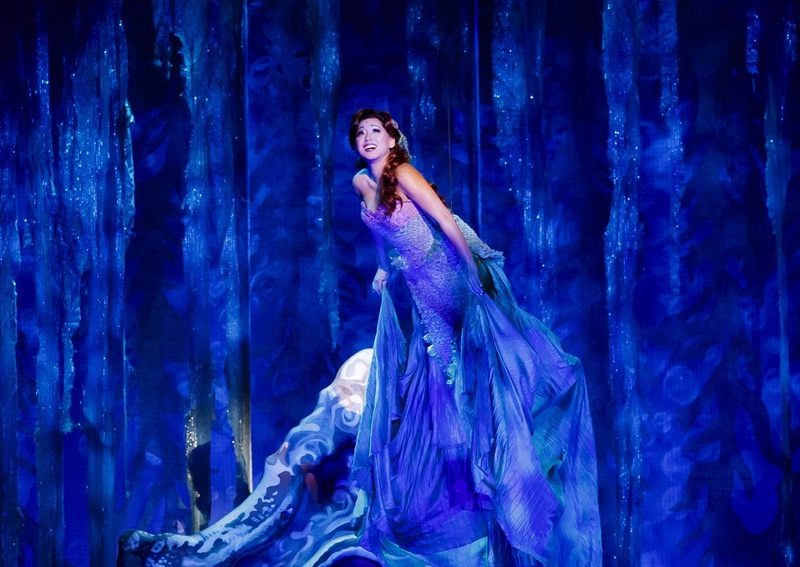 “The 5th Avenue Theatre has a tradition of producing a spectacular musical treat for families at the holidays, and The Little Mermaid is no exception,” said Executive Producer and Artistic Director David Armstrong. After the run closes at the 5th Avenue Theatre, the show will then travel to several cities in 2017. But for right now, Huey is happy to be home and spending time with family for the holidays. "I've been working in New York and it’s not been possible to come back these last three years," she said. Huey’s previous 5th Avenue credits include Jasper in Deadland, Rent, Mame, and Adventure Musical Theater. Since graduating from Cornish College of the Arts in 2008, she’s performed at the Village Theatre, ACT Theatre, Seattle Children’s Theater, Signature Theatre, Milwaukee Repertory Theater, Flat Rock Playhouse, Prospect Theatre, and Playwrights Horizon. She received a Helen Hayes Award Winner for Best Leading Actress for Signature Theatre’s Miss Saigon. "One of the great things about Cornish is that everyone teaching there are working professionals. My internship at the 5th meant being in Mame with [professor] Timothy McCuen Piggee," she said. "Later he introduced me to Martin Charnin, who wrote Annie, and helped me get work with him. Cornish prepared me for what happens after college." Still Huey hadn’t planned originally to go into theater as either a college degree or a career. "I was going to go to Edmonds Community College because they had a choir, Sound Sensation," she recalled. "But my voice teacher suggested Cornish. Then I played Eponine in high school. I realized I couldn’t do just music, that I would miss theater. That I could have the best of both worlds." Today, Huey loves working on new musicals. She recently sang the title role in Solana, a work-in-progress by Michael Heitzman and Ilene Reid. "It’s a beautiful musical fairy tale about an Asian-American woman trying to figure out who she is," Huey said. But for the next year, her principal fairy tale will be a certain mermaid princess. Huey is thoroughly enjoying the role and being back in Seattle. "The energy of Seattle soothes me," she said. "Especially after New York. It’s nice to be back and walking down quiet streets. And the views are amazing."